With a moving storyline, we come to know How Star Wars Saved My Life as an empowering true story of courage from an adult survivor of childhood sexual and physical abuse from priests. 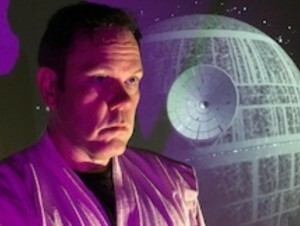 Using the power of pop culture’s iconic Star Wars, this play reveals how the film was integral to this child’s coping with abuse, giving a sense of hope that good can triumph over evil. Through the play, the silence of this taboo topic is challenged and ultimately shattered. With Valerie Methot’s direction, this important Canadian play boldly confronts the issues around abuse and reinforces that victims are not responsible for the abuse they endure. Through the playwright’s own experiences, the play takes us on a journey of transformation and of post-traumatic growth and bravery. With Nicholas (played by Nicholas Harrison) on the path of the Jedi and his faithful droid as his companion, we escape into a world of healing and inspiration. How Star Wars Saved My Life is a testament to Nicholas’s strength and resiliency. This brilliant story reveals how the magic of the Star Wars Universe helped guide him as an artist, father, and compassionate human being. It is bold and powerful, during the performance I glanced at the silent audience which had people in tears, obviously their was emotion and feelings at play with what some had to listen to and grasp during the performance. How Star Wars Saved My Life is the first Some Assembly production from the point of view of an adult raising awareness to issues facing children and youth as well as adults. The show runs through to December 10, 2017 at Performance Works.